Fort Caroline (1564-1669) - First established by the French 25 Jun 1564. Named Fort Caroline after King Charles IX of France. Abandoned after 1669. Also known as Fort Mateo. The first European colony north of Mexico. Built by the French in 1564 to establish their claim in the new world. Built as a triangular fort with a wood and earth palisade. The construction of this fort in the new world caused Spain to counter by establishing St. Augustine in Florida the very next year, 1565. Fort Caroline was established 25 Jun 1564 by Commander Rene de Laudonniere and some 300 colonists. By 1565 word was out about the new colony and a Spanish fleet was sailing to dispatch the colony. A French fleet was raised to reinforce the colony and protect it from the Spanish fleet it and reached the colony before the Spanish. The Spanish fleet arrived and found it reinforce and sailed off to found St. Augustine on 8 Sep 1565. The French commander decided to follow the Spanish fleet but the French fleet was dispersed and wrecked by a hurricane. 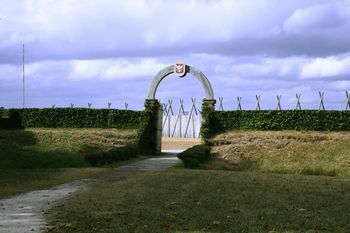 This left the remaining colonists at Fort Caroline vulnerable and the Spanish attacked them on 25 Sep 1565. Most of the men at the fort were killed (about 132) but the women and children were spared (about 50) and the Spanish took the fort. Meanwhile, about 350 survivors of the French fleet surrendered to the Spanish and they were slaughtered at a site that came to be called Matanzas (slaughters). This site later became the site of Fort Matanzas. Fort Caroline was renamed Fort Mateo by the Spanish. The French countered by putting the torch to Fort Mateo 14 Apr 1568 and the Spanish promptly rebuilt it after the French left. When Sir Francis Drake sacked St. Augustine in 1586 most of the survivors fled to Fort Mateo and the fort remained active until about 1669. 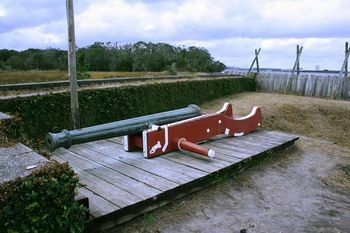 Fort Caroline National Monument. Reconstructed in 1964. Period guns and mounts in place. Location: Fort Caroline National Memorial, Jacksonville, Duval County, Florida.